Property Owners of Gulf Cove, Inc. 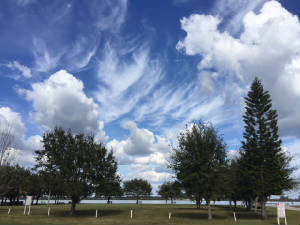 This web site is brought to you by the members of Property Owners of Gulf Cove Inc.
Our Gulf Cove community is located in Charlotte County, Florida on the banks of the scenic Myakka River with direct boating access to Charlotte Harbor and the Gulf of Mexico. 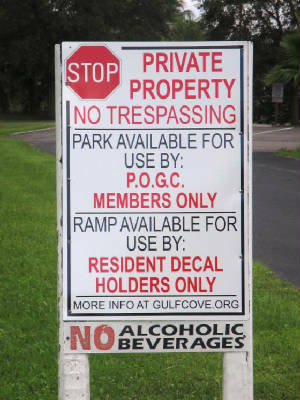 Gulf Cove has a voluntary property owners association called Property Owners of Gulf Cove, Inc. (POGC Inc.). 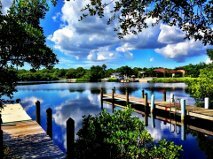 By joining POGC Inc. you become part of the decision making process for the management of two pristine, waterfront recreational properties -- our private park and boat ramp. 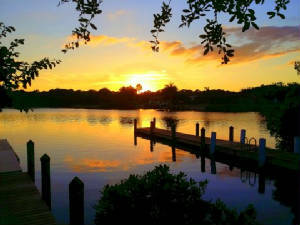 These properties encompass a little over 5 acres on the Myakka River. Becuase these properties are privately owned by POGC Inc, not one cent of Gulf Cove property taxes are used for their maintenance and improvement. All funding for that must be generated by POGC Inc. through annual member dues, annual ramp decal fees and various fundraising events. 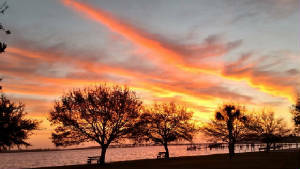 We hope the following information will be a catalyst to attract new members to join POGC, Inc., Gulf Cove's voluntary property owners association. For those unfamiliar with our history, POGC Inc. was initially formed as a voluntary property owners association for the area specified in our by-laws in order to provide community strength in dealing with various governmental and commercial organizations that have the directed, planned or implied responsibility for providing services, utilities, mosquito control, erosion control, canal maintenance, land maintenance, street maintenance, and/or drainage to the community. POGC Inc. can and will push for both general area improvements and corrective action in situations which may result in injury or property damage, i.e. road improvements, street signs, drainage improvements etc. In 1980 General Development Corp. (GDC) deeded 3.487 acres of property at the corner of Norlander and David to POGC Inc. Our private boat ramp is located on that parcel. In 1986 GDC deeded another 1.765 acres of property located at the end of Norlander to POGC Inc. That parcel was developed into a park for the use of POGC Inc. members. The POGC Inc. board of directors and officers are unpaid volunteers. They donate their time and talents for the improvement of the park and ramp recreational areas as well as the community of Gulf Cove. It is important to note our park is not a public park. Its use is restricted to the members of POGC. 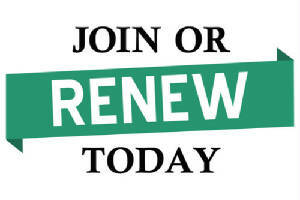 To become a regular member you must be a property owner in Gulf Cove and be of legal age. 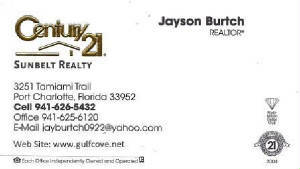 To become a social member you must provide proof of residency in Gulf Cove and be of legal age. Membership runs from Jan. 1 through Dec. 31 each year. Our ramp is not a public ramp. Its use is restricted to Gulf Cove property owners and residents renting their homes. 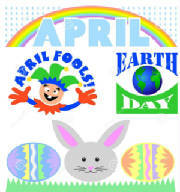 A current ramp decal sticker must be obtained from POGC Inc. and displayed on the trailer/boat before using the ramp. The decal is valid from Jan. 1 thru Dec. 31 in the year it is purchased. All trailers must be registered in the name of the Gulf Cove property owner or resident. Boat trailer size is limited to no more than two axles and an overall length of less than 28 feet. Both of these recreational areas are subject to the reasonable right of POGC Inc. to exclude individuals for the abuse of privilege. Please note there is a county ramp in El Jobean available for use by those residents unwilling to help support and maintain our Gulf Cove private boat ramp through the purchase of the required decal. Our subdivision of Gulf Cove is not an association deed restricted community. We are governed by the Laws and Codes of Charlotte County. POGC urges all residents to make our advertisers your first choice when looking for a service or business. Click on the ADVERTISER INDEX tab at the left to view those businesses that support Gulf Cove.